Hear are a couple of pictures from last weekend and the beginning of this week. I'm trying to keep up with all the reports coming in but there are soo many good reports I'm getting over whelmed. first is Fred he and his buddy's crushed bi...g flounder out around the local reefs. 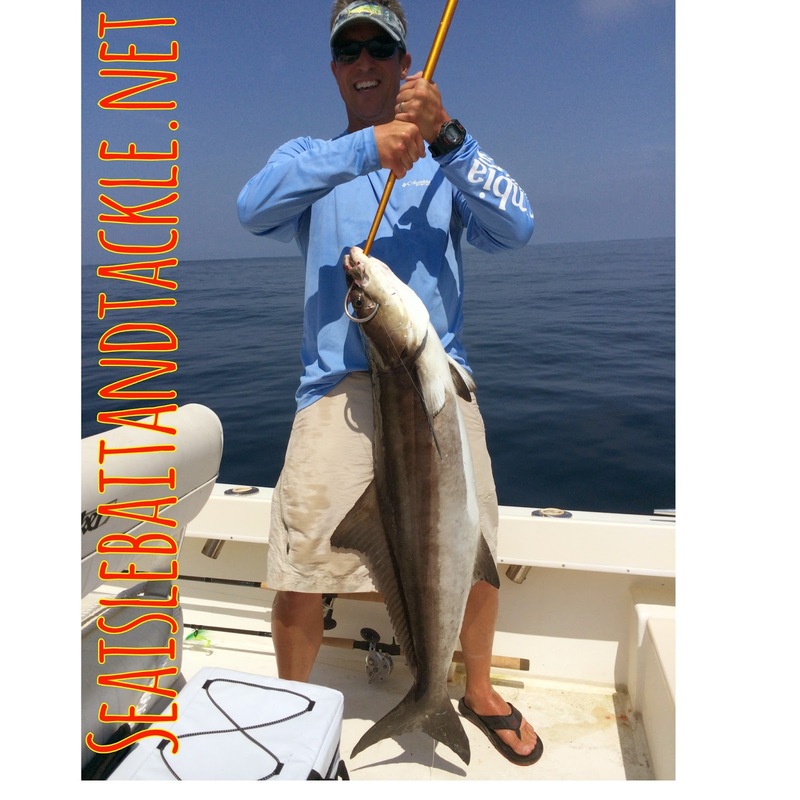 then there is Drew wile looking for Mahi's he came across this 40 pound Cobia and got it to bite a minnow. 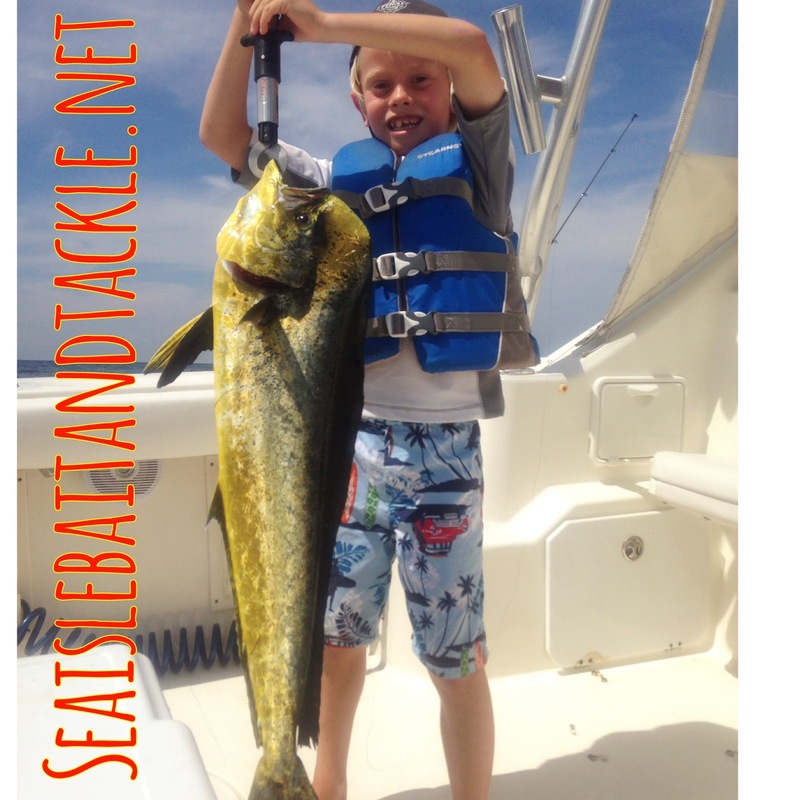 then there is Dusty he his Dad and grand Pop went out in search of inshore Mahi and where not disappointed with the results. dusty landed this all buy him self I'm going to share the video of the fight soon. 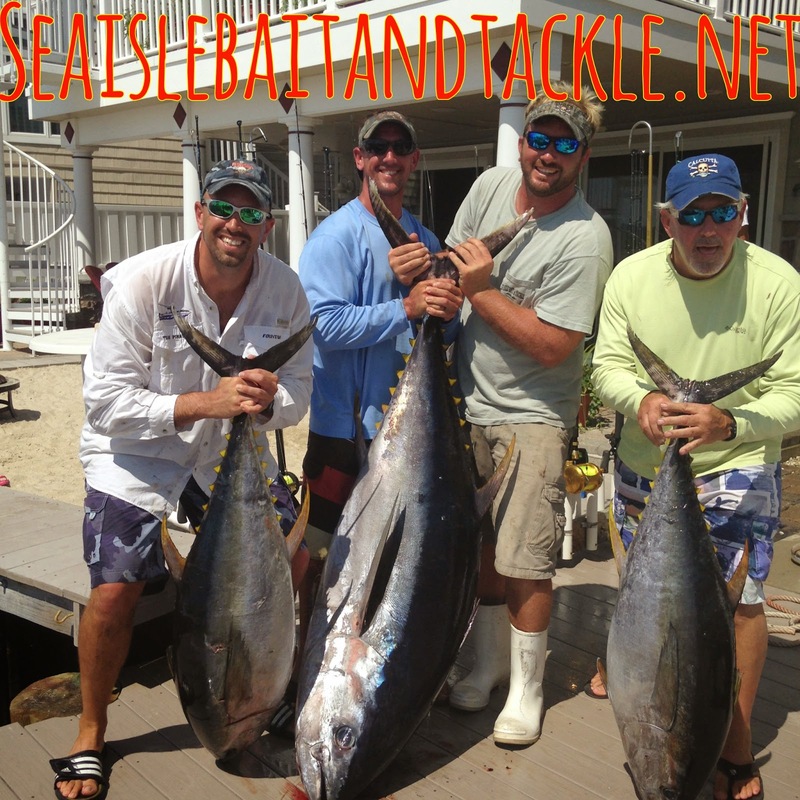 Joe, Karl, Ricky and Frank headed off to the deep on Saturday afternoon in search of tuna and they were not let down. They started trolling late in the afternoon looking for bait and signs of life. 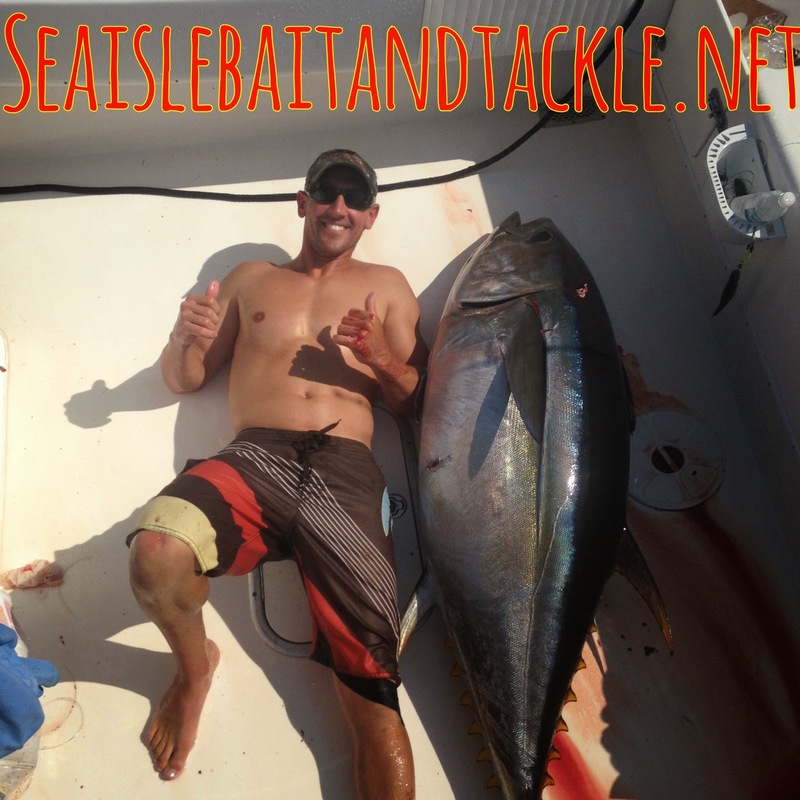 Around dusk they set up to chunk and after a mere 5 minutes hooked in to a very nice yellow fin on a butterfish. After boating that fish, they decided to try some jigging and hooked in to a huge big eye after fighting it for over 2 ½ hours the line got tangled in the prop and the fish was lost. But the crew did not lose hope they regained their composure and reset the lines they did not know what was about to happen. Minutes after lines were back in the water another huge hit again on a jig. 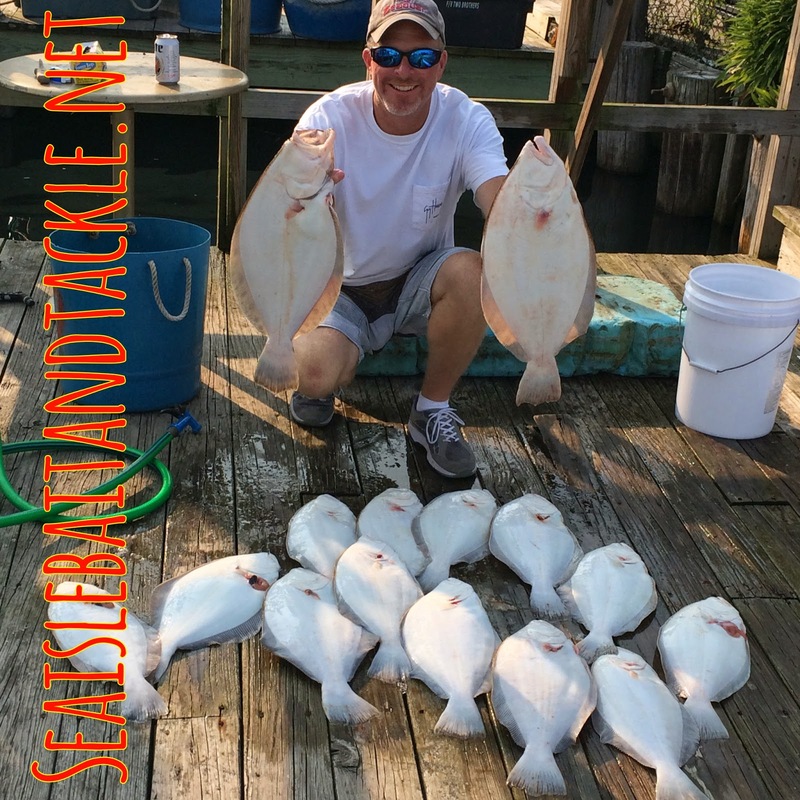 Geared with a 6 foot 6 Heavy Shimano Trevala and a Lx 6.0 Avet loaded with 80 pound Power Pro purchased only hours ago here at Sea Isle Bait and Tackle they knew they were capable of landing the big fish at the end of the line but it was going to be a long battle. They hooked in at 11 pm and boated the huge big eye at 10 am the next day. It was an 11 hour battle of will, talent, strength and determination. When all was said and done the crew returned to Sea Isle City with 2 yellow fins and a 6 foot long big eye. Hats off and congratulations gentlemen.